I recalled with chagrin my unkept promise from Sabang to buy better sandals as I slipped and hopped along the dark hilly path to Nuts Huts. I’d been told that the alternately rocky and muddy trail, which winds from the small highway through a tiny village and down into the jungle to the infamous stairs at Nuts Nuts, was only 800 meters, but given my American unfamiliarity with the metric system, I had no real grasp of just how long that was, carrying my travel pack on my back, laptop backpack on my front, satchel slung across, in flip flops, in the dark, on the unpredictable surface. I sighed, shaking loose rocks out of my sandal, and thought, “well, at least it’s not raining,” and my flashlight dulled, and burnt out. It wasn’t supposed to be dark when I arrived in Bohol, but my CebuPacific flight from Siargao was an hour late, which meant I just missed the 2pm ferry from Cebu City, and the 3:30pm ferry left 45 minutes late, and so the sun was well down even as I arrived in Tagbilaran, the capital city of Bohol. At that point, I abandoned all my ambitious (and affordable) plans to find and take the local bus to Loboc, and walked up to the first guy offering a minivan, and jumped in, 900 pesos directly to Nuts Huts, a riverside jungle lodge just outside of Loboc, but seemingly in a land to itself. “Directly” however, had its limits, as the van left me at the side of the highway next to a muddy track that skirted around what appeared in the thin moonlight to be a rice paddy, and off into tree shrouded night. 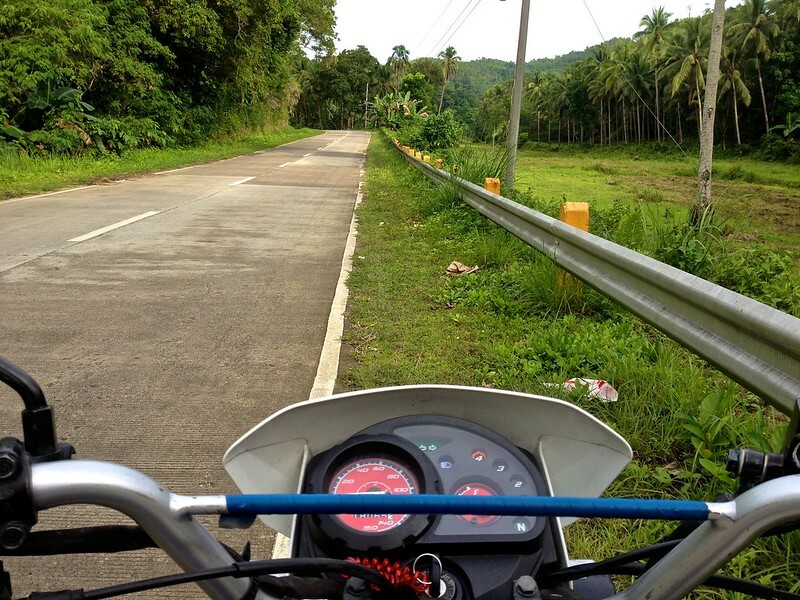 There is also the option to hire a motorbike from Loboc town that will take you all the way down the trail, but I figured I’d already spent enough, and again, 800 meters didn’t sound all that far. The dud flashlight was new, purchased right before my Palawan expedition, and barely used, so its sudden death was surprising. My iPhone with it’s handy flashlight app had died earlier on the ferry, and the moonlight was not really sufficient to tell the difference between the rocks and holes in the path. I shook the light in frustration, and banged it against my hand a few times, and lo, it sputtered dimly to life again, a dull orange that pulsed slowly in and out. I laughed with relief and carried on, smacking the light against my palm as it faltered every few minutes, and after what felt like an absurd amount of time, I arrived at the top of the stairs. 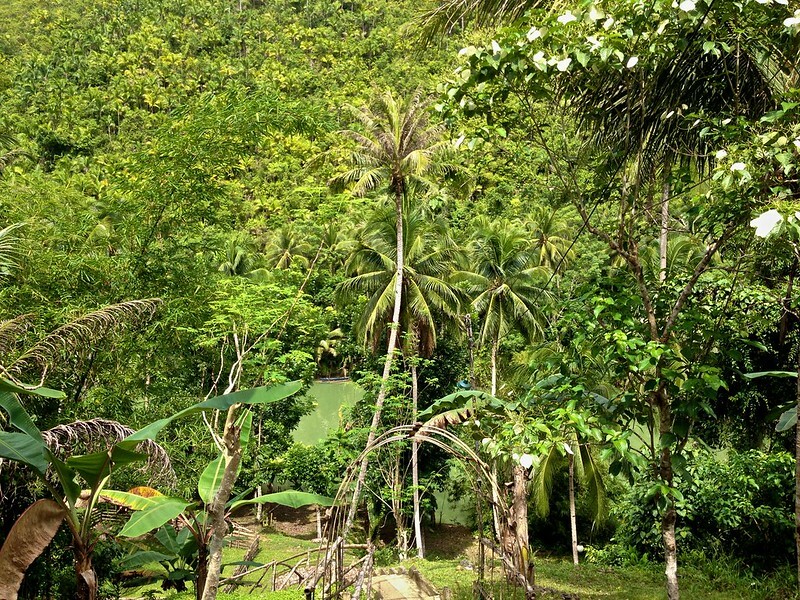 Nut’s Huts is arrayed down a mountainside, with the reception and café at the top, and the nipa hut accommodations down on the shore of a slow green river as it winds around a curve, the jungle rising in a thick wall on the mountainside across the smooth avocado colored water. I gingerly made my way down the steps, grabbing at the mushroom covered bamboo railing, with visions of me pitching headlong down the hill, and was eminently grateful to arrive in one piece, and even more so that there was a room available. Did I really go all that way without a reservation, you ask? Yes, yes I did; living on the edge. Over dinner and a beer I made plans for the following day, which, because I spent so long in Siargao, was my only full day in Bohol before I had to catch my flight out of the Philippines, and so I had to fit the important sights in one go. 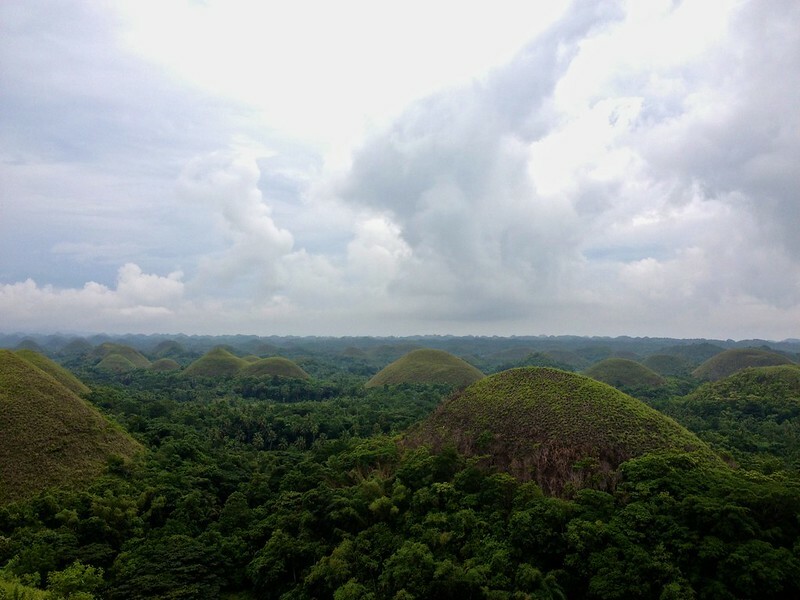 Bohol is famous for the Chocolate Hills, big loamy lumps spread across the horizon, whose sparse vegetation leads to a brown color, particularly in the summer months, lending to the illusion of giant chocolate drops scattered through the jungle. 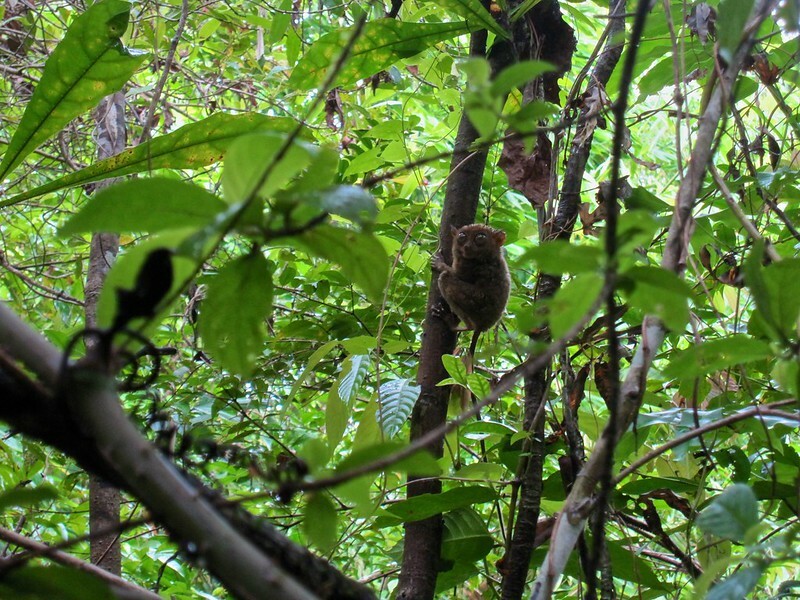 Bohol is also the home of the rare tarsier, a pint sized primate with giant eyes, and there’s a local reserve were one can easily go to spot the tiny monkeys (note: they are not actually monkeys, I just like the phrase: tiny monkeys!). In order to visit both sights, I was going to have to brave a motorbike again, and so I arranged to rent one first thing in the morning, and lumbered down the stairs to my hut, falling asleep in the humid jungle night with loud jungle noises all about, mosquito net tightly tucked in. In the morning, I dragged myself up the stairs, and trying my best to not appear winded, picked up my helmet at reception. The choices were between what sincerely just seemed to be a construction helmet, and a rather large half helmet, which slid jauntily to one side as I tried it on. Undeterred, I took it, and hiked back up to the highway, the walk really quite pleasant in the daylight, where a local named Oliver waited with another Honda XRM 125. I put on a brave, sure I know what I’m doing face, climbed on and motored slowly up the highway. The drive is really beautiful, all curvy mountain roads, through jungle, forest, and rice fields, but my white-knuckle grip precluded any picture taking, for which I apologize. As I motored along, confidence increasing, the bright hot sunny day began to darken, and within 20 minutes, rain began to splatter lightly across the scratched face shield of my helmet. I was not at all prepared for rain, although I really should have been, since rain has been the one constant on my adventures. As the rain began to worsen, I pulled over and darted under the rusty overhang of a shed-like structure just as the downpour turned into a full on bath. The side of the road filled with water and I balanced on a small stone as my refuge became a small lake, the wind blowing drops under the overhang like heat seeking missiles, and I located streams from several holes in the roof with the back of my neck. There was not a soul in sight, until the figure of a very old man came shambling barefoot through the sheets of rain alongside the road. He shuffled right up to me, and stood next to me under the shelter. After a moment, he mumbled something in the local language, gesturing weakly at me, the puddle we stood in, and perhaps the sky in general, his grey eyes focused on nothing in particular, before hobbling off down the road again, leaving me once again, alone and wet. 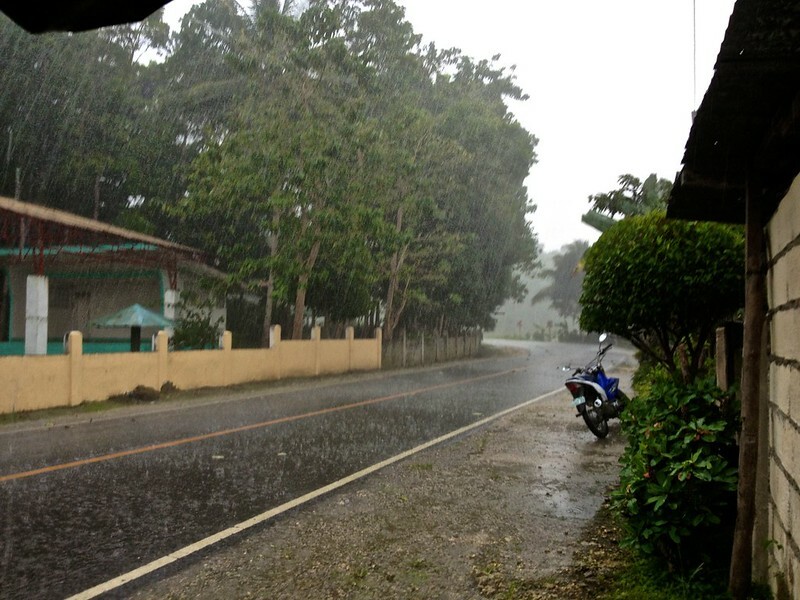 The rain began to ease a bit, and I decided to seek better shelter, and slid onto the soaked seat of the motorbike, and drove oh-so-slowly and carefully down the road looking for a restaurant or shop or anything, until I spotted a sign with a big arrow, and pulled into the gravel front of the Balay sa Humay Rice Museum. The rice museum appeared to be completely deserted, despite a large sign advertising tours, cooking instruction, and a deluxe café with local and international cuisine, and I wandering dripping through the dusty displays of rice sacks, scythes, an oversized mortar and pestle, and some kind of machinery, rice related, I can only assume. I called out a hello, and an old woman wandered out from the back, looking very surprised to see me. I asked about maybe could I have some coffee, and she smiled and gestured to a large shiny machine in the corner with a picture of smiling people enjoying steaming cups of Nescafé. Under her direction I put in a 5 peso coin, and a cup dropped down and a stream of sweet creamy coffee spit into it. She directed me over to a small plastic chair at a small wooden table and disappeared back into the rear of the building. Well, okay, I thought, and sat and drank, and pondered just how long I should wait for the rain to let up. As I sat there, two young women peered around the corner, slowly crept out and sat in chairs at the next table over, until, after I smiled at them, they dragged their chairs over to me and asked the usual series of questions: where was I from, why was I alone, and how old was I. Their English was not great, but we chatted briefly, they were accounting students at a local college who worked there at the museum, but I could not quite ascertain what they did, or why the place was so deserted. After a very long silence of us smiling and nodding at one another as I finished my coffee, I judged that the awkwardness outweighed the amount of rain still sprinkling down, thanked them, and scurried out the door, hopped on the bike, and zoomed with relief down the highway. I arrived at the Chocolate Hills turn off without further incident, although I did stall out attempting to downshift as the little motorbike puttered weakly up the steep hill to the overlook. Still a crappy driver, it appears. 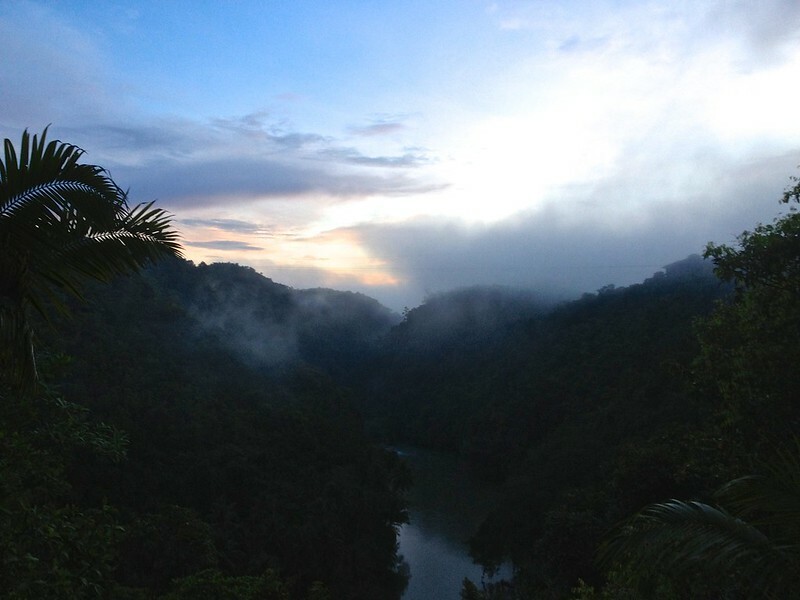 The vista over the hills is very lovely, and I hiked around and sat and enjoyed the view for awhile, before heading out again, back the way I came, and beyond through Loboc town, towards the tarsier sanctuary. We saw several others, sleeping, and less photogenic, but that first guy made my whole day, I think. It also made the day to get back to Nuts Huts successfully, returning the bike to Oliver, and be just in time to watch the sun set over the jungle river, San Mig in hand. At last look, the Nuts Huts website doesn’t work, but I just showed up and everything worked out. They have all the info you need about the sights I visited, as well as other wonderful spots, if you have more than one day as I did. You are such a great writer! Loving these adventures! Wow. Such an adventure. I think I would have stayed at the Rice Museum, & ask for a place to crash. Its too scary to be on a bike in that kind of rain! Go get yourself a rain jacket silly. Be careful hitching rides. 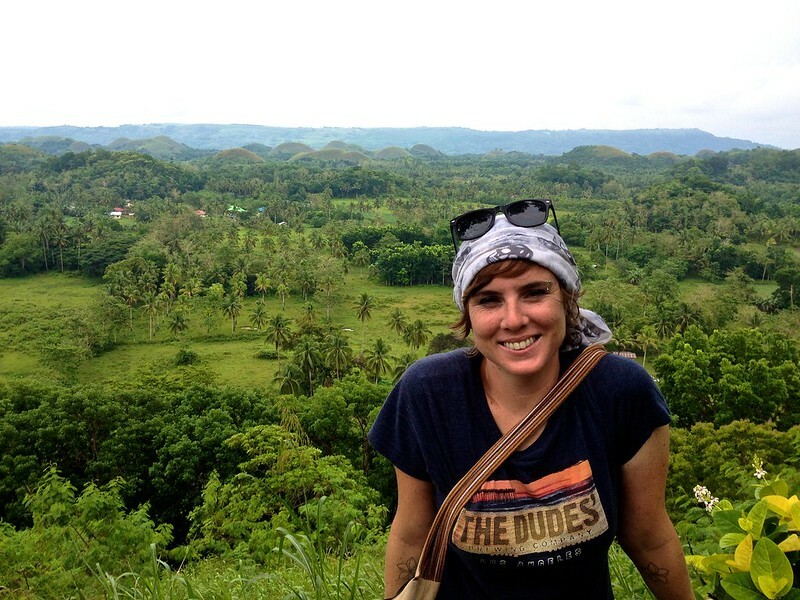 Love your blog Melia! Those monkey were worth the trek! 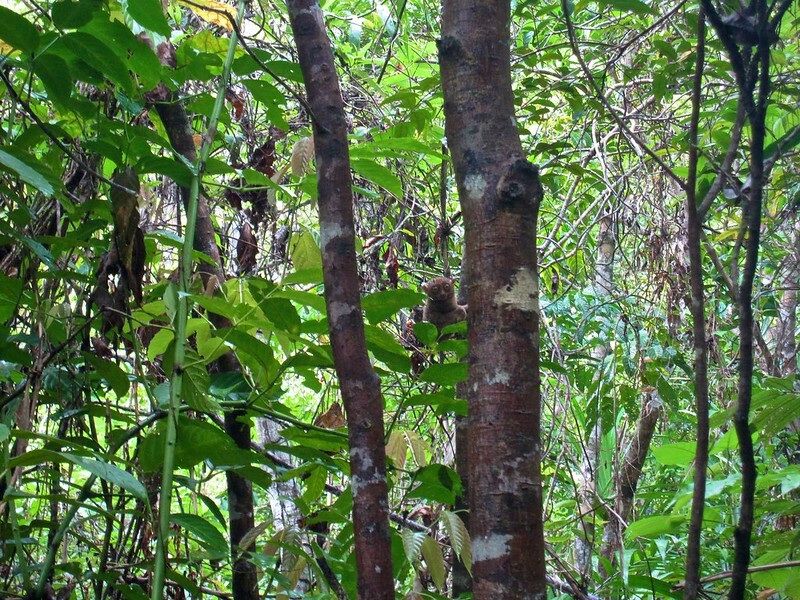 While I still feel a little water logged, I can appreciate the sight of those tarsiers. They reminded me of your admiration of those sloths you came to love in Costa Rica. What next ?? Take good care you adventurer! Thanks, Luanne, it’s true that my love for the strangest little animals will lead me to the oddest places! Rainy afternoon on a jungle road. American tourist takes shelter in the “rice museum”. Staff is shocked! “How’d you get here? !” hahahaha Loving the stories. Rice museum, only in SE Asia. I met a fellow traveller who told me about how she positively offended her tour guide by telling him about how she mostly eats flavored rice at home, rather than white rice. Do not mess around with a Filipino’s rice, apparently. Sounds like some mighty fine adventuring! Thanks buddy! I hope to make it in your direction at least at one point on this journey.